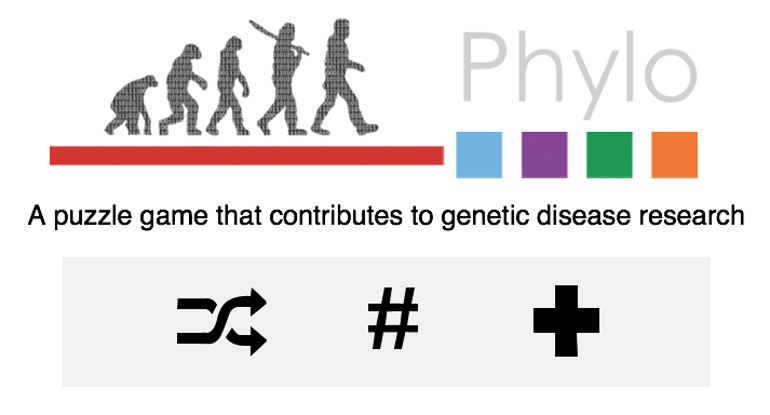 For the past three years, 300,000 gamers have helped scientists with genomic research by playing Phylo, an online puzzle game. Now Jérôme Waldispühl, a McGill University computer science professor who developed the game with colleagues, is making this crowd of players available to scientists around the globe. The idea is to put human talent to work to improve on what is already being done by computers in the field of comparative genomics. Phylo is a cross between Tetris, Rubik’s cube, and an old-fashioned sliding-tile puzzle game. As gamers line up colored rectangles that represent real genetic material (in the form of DNA sequences), they are helping to pinpoint the genetic anomalies that may be the key to a range of diseases that include diabetes, breast cancer, and retinoblastoma (the most common form of malignant tumor in the eyes of children). Since it was first launched, players who range from teenagers to seniors have suggested solutions for over 4,000 puzzles based on genomic data that has already been gathered. Now these gamers will be put to use helping scientists with a whole new range of research. The project is described in the journal Genome Biology. Waldispühl and his colleagues are hoping that along with providing solutions to genomic problems, this process will also help to promote a better general understanding of scientific research. Waldispühl and his colleagues have already fielded inquiries from scientists working on viral bioinformatics at the University of Victoria. And they hope soon to hear from many others. Phylo is already available in 10 languages, including German, Russian, Chinese and Hebrew, and a future goal is to translate the website into Japanese, Arabic and Italian. The Genome Canada, Genome Québec, and the Canada Foundation for Innovation and the Canadian Institutes of Health Research funded the work.